Ninety six minutes. Eleven shocks by defibrillator. Two dozen rescuers pounding his chest in shifts to bring vital oxygen to his limp body. A helicopter, even. That's what it took to revive 54-year old Howard Snitzer this month. Oh, and a little celebrated thing called a capnography machine that let everyone know that he was still capable of being brought back from the brink of death. 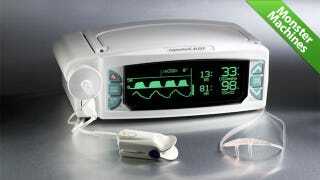 A capnography machine is simply a device that detects co2 levels. By monitoring a patient's breath, rescuers can tell if the body is absorbing oxygen and expunging co2—even if they're unconscious, without a pulse, and the patient is only gaining circulation and air by chest compressions. Capnography machines work on the idea that co2 absorbs infrared radiation—the more infrared reflected back, the less co2 in the blood or air. The thing is, capnography was until recently only used for lung disease diagnosis and to check anaesthesia effects on patients. Using it in the field to save lives is an amazing development. Monster Machines is all about the most exceptional machines in the world, from massive gadgets of destruction to tiny machines of precision, and everything in between.